It is so delicious you will be trying to lick your plate when no one is watching! Trust me I have seen it out of the corner of my eye! We are huge strawberry fans here. Are you? 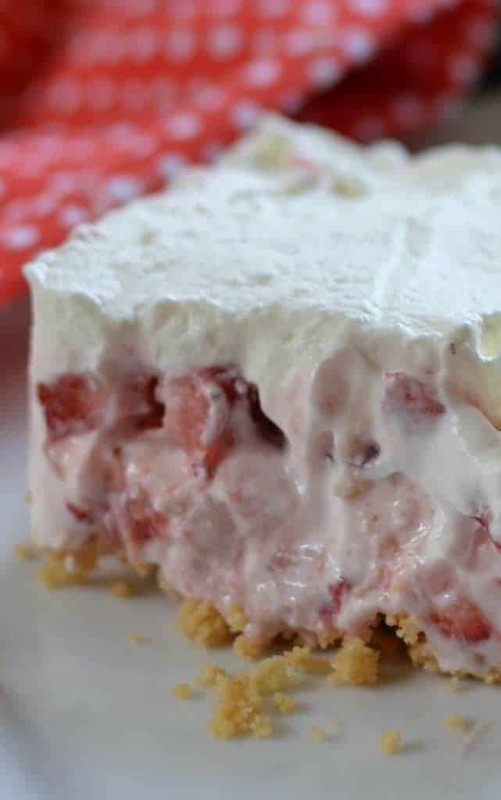 Here are some of our favorite strawberry recipes. 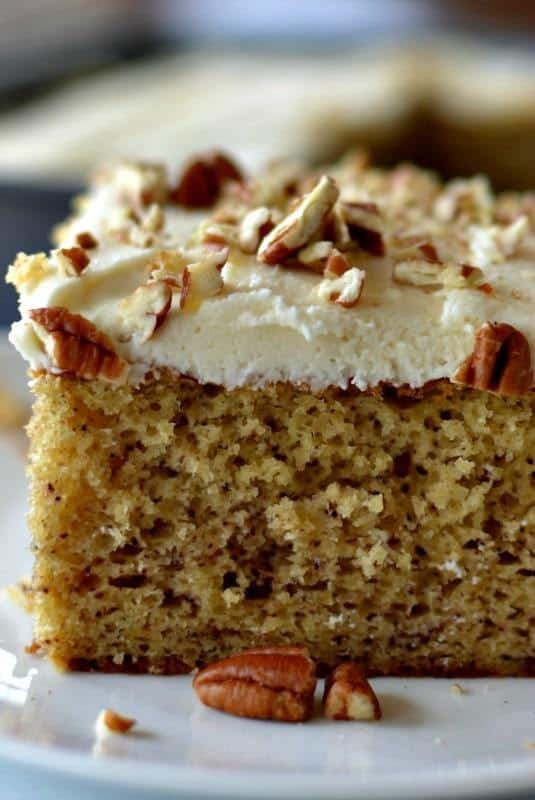 Other dessert recipes you will love!! How do you store the leftovers, in the fridge or freezer? Fridge! Sorry about the delay! Made this last summer! It was delish. 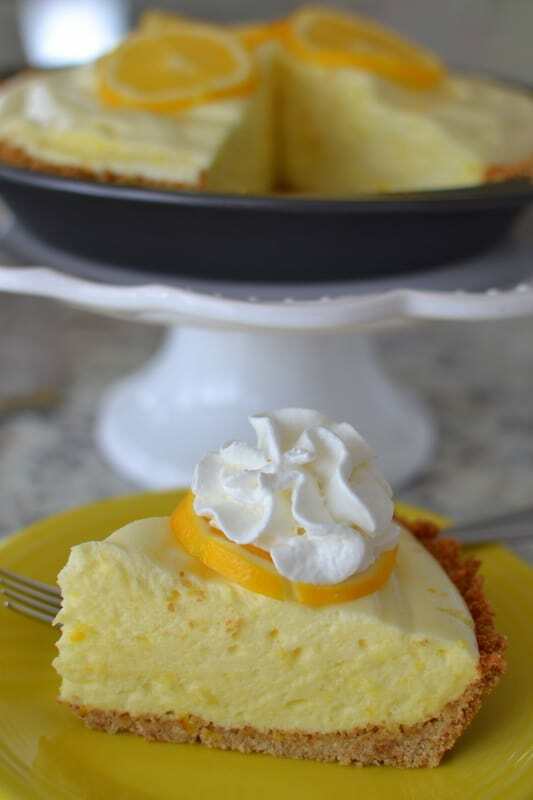 It would be good with a vanilla wafer or shortbread crust too. Definitely worth making again. Thank you! Yes it would be! Do you mean freeze in freezer or should you have used refrigerator. Didn’t quite understand freezing the fresh berries. Do you make day before or few hrs before serving. Sounds good. You should just place in freezer just in the intervals that are called for. That is to help freeze the layers to make the different layers easier to spread. When complete it should be stored in the refrigerator. Please let me know if you need more clarification. Happy cooking! Can you use regular whipped cream that’s already prepared instead of the whipping cream? …and if so….do you still add the powered sugar? Thanks for the recipe…always love to fry things made with strawberries. Sorry that was to have said *try instead of fry….lol. Can you substitute vanilla extract for the orange? Yes of course you can. It will give you a little bit of a different flavor but still delish!! I made this for a 4th July Family party. wow was it good! I ate more than I should have but it was Love at first bite. That is too sweet. Thank you so much. LOVE the compliments so much!! This sounds delicious & my Granddaughter loves strawberries. I do not have a stand up mixer only a good portable one – can this be used for the cream cheese mixing step?? 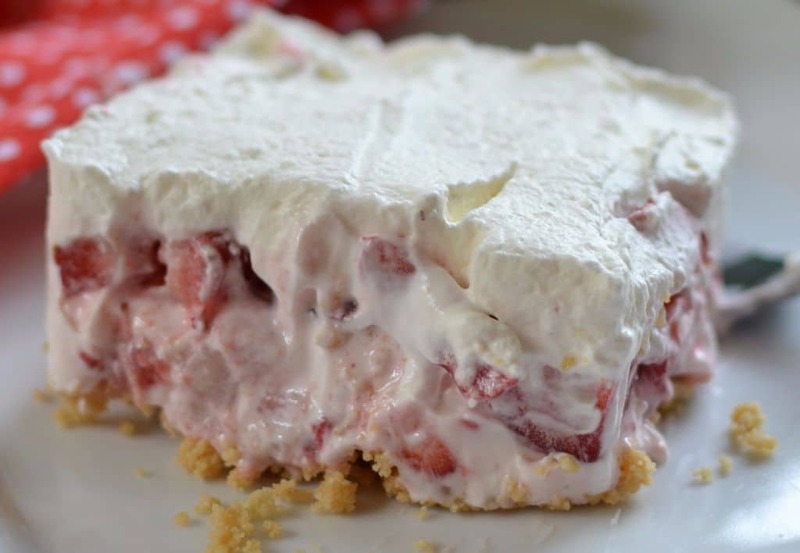 I have made this up to the cream cheese, sour cream strawberry mixture….in freezer just now. 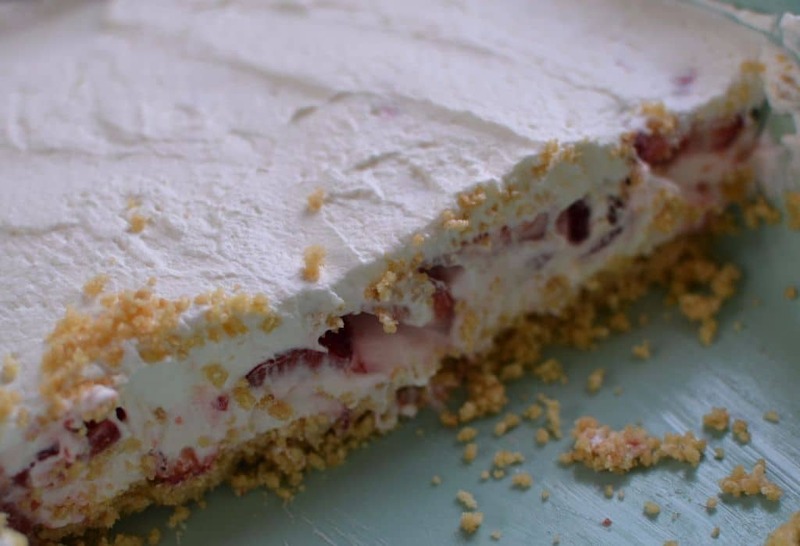 Can I wait until tomorrow to add last layer of whipped cream, strawberry mixture…right before serving? Thank you…I did cover….I will let you know what my friends and I think! Sounds great. Let me know what you think Mary! It was a huge hit! Refreshing, light , and yummy! I don’t have orange extract, and I likely won’t purchase any. How about orange zest instead? Yeah I think that might work. Let us know! My Mother used to make a dessert that actually called for Pecan Sandies, so I say yes. Yes indeed you could. I love blueberries!!! I’ll be making this for a family get together, could this be made a head of time and put in freezer? I would not freeze after putting on the whipped cream. You could make this up to the whipped cream part and store tightly covered in the freezer. 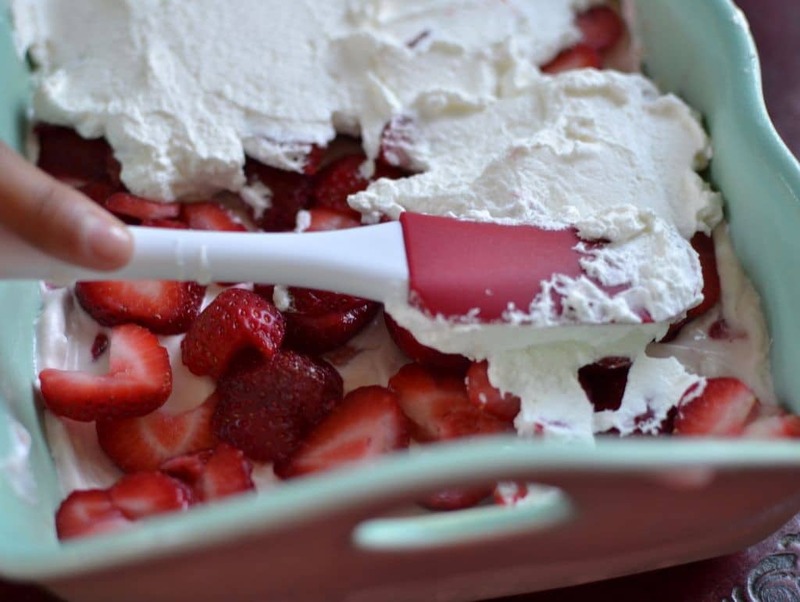 Remove and add the whipped cream before leaving for the party. Love a good party! thanks I will be making this for sure! Hi! I can not find sour cream in my place. Is there a way to make sour cream at home or substitute for this? Thank you. Really want to try this. Looks so yummy. Can you use frozen berries ? I do not recommend it because the added moisture might make the crust soggy. Sorry!! Recipe doesn’t say whether you remove the cream centers from the Oreos. If so, could you use those Pepperidge Farms Chessman cookies instead? I love the flavor of those. You do not remove the cream filling. You could try it with the Chessman cookies. If it seems too dry to press together add 1-2 tablespoons more butter. OK, I guess it would be like making a graham cracker crust but with the cookies instead. Will try that, thanks! No please leave the cream in the cookies. Yes you can. Sounds like a plan! !